This quirky umbrella was inspired by designer Sebastian Errazuriz's rainy day golf outings. While living in Scotland, he and his friends often found themselves carrying golf clubs and umbrellas simultaneously, which struck inspiration in the young designer. Made of steel, fiberglass, polyester, and rubber. 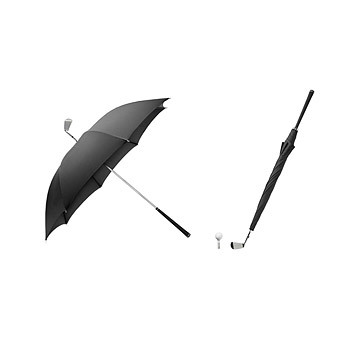 This product is an umbrella and should not be used as a golf club. Designed by Sebastian Errazuriz. Made in China. As an artist, his large-scale avant-garde public artwork has received critical acclaim and been covered in hundreds of press articles. His mix media work has also been the subject of several international solo exhibitions. Sebastian is currently preparing a series of public urban art installations for New York, Madrid and Santiago. Sebastian has been a teacher of art and design at Parsons in NY as well as several universities in Santiago. Lately he has also been invited to curate art and design shows at Sebastian Barquet Gallery in New York or SAM gallery in Santiago. Sturdy and fun. It's full-sized, not just another reproduction "mini"
This has the "Wow" factor! My boss loves golf and was always losing his little pop up umbrella. This umbrella is substantial - it is the size, shape and feel of a real golf club. He absolutely loved it!